A few days ago, I posted about losing most of my apps when I upgraded my phone. The Sprint store didn’t move them over, nor did they tell us (my in-laws and me) the trick for getting them back. My paid apps were easy, because I found them on Google Play and reinstalled them. I’m going to go all technical writer on you now (although I’d never use purple callouts in my day job) to show you what I did to recover my free apps. 1. From the browser on your phone or on your computer, go to https://play.google.com/apps. 2. Log into your gmail account. 3. The Google play page displays your application libraries. Every app you ever installed on a phone is listed on the page. 4. Click a phone icon to view the apps installed on that device, or view your library to locate the apps you want to install on your new phone. 5. When you find an app you want, click Install. 6. The Send to Another Device list should should your new device by default. If it does not, click the down arrow to select the correct device. 7. Click Install. The application will be pushed to your phone or device. There is one caveat. 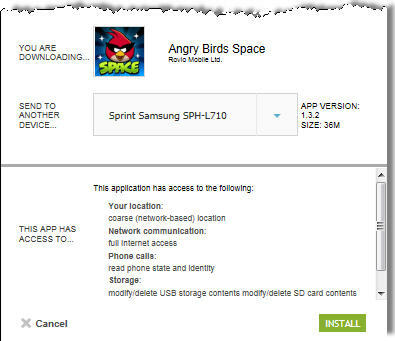 If the application or game had data from your old phone, you will not have that data after the fresh installation. However, if you have to log into the app develper’s server, then you should be able to recover your game progress or saved data from them. I hope you find these instructions helpful! Declare war on the caterpillars eating my broccoli plants. I finished editing my middle grade WIP vomit draft. (Yay!) Now, I have to make the changes and fill in plot holes before my 14-year-old’s birthday. That gives me less than 2 weeks to surprise her with a rough draft of the story she helped inspire. Getting closer to fitting into those smaller jeans. School PTA minutes need approval.